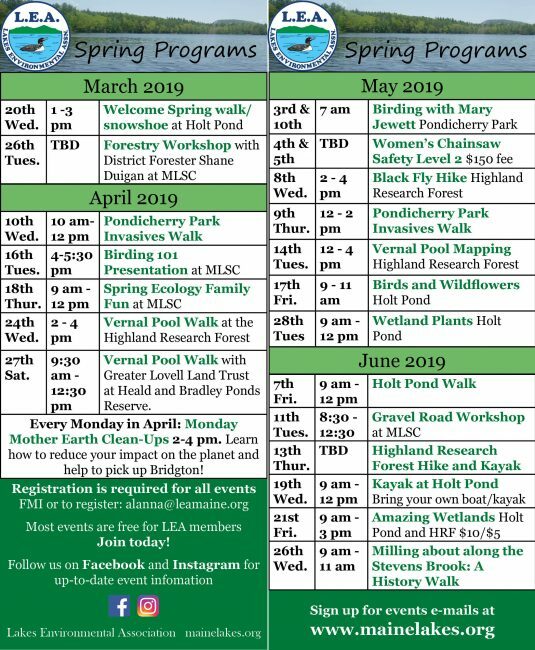 Lakes Environmental Association offers outreach education programs throughout the year in the Natural Resources of the Lakes Region Series. The goal of our education series is to encourage a connection to place through explorations of the natural world. We believe that with a strong connection to place, an interest in environmental stewardship naturally follows. All events are free to LEA members, except where special program costs apply. To become a member, click here. We encourage you to let us know you will attend by emailing alanna@mainelakes.org or mary@mainelakes.org. Programs are subject to change due to weather and minimum participation. Guided walks and natural history presentations are part of the Natural Resources of the Lakes Region. This series is made possible in part through the support of Hu and Ray Caplan and their family, and in part by our members. The Caplans recognize the vital importance of education in all aspects of LEA’s work in protecting the Lake Region’s most important resource and asset: its bodies of water and watersheds. If you are interested in contributing to the education program please contact us! You can always find out about events on our facebook page and through our homepage. Do you have some ideas of what you’d like to see? Please email alanna@mainelakes.org to talk about some possibilities! Questions about any event? Please email us! Note: pop up events and changes to the calendar occur frequently! Please subscribe to our email list or follow us on facebook for the most updated version.